TIPS: Using the opposite as compliment to each other. The distinction between warm and cool colors has been important since at least the late 18th century but is generally not remarked in modern color science or colorimetry. The contrast, as traced by etymologies in the Oxford English Dictionary, seems related to the observed contrast in landscape light, between the “warm” colors associated with daylight or sunset and the “cool” colors associated with a gray or overcast day. Warm colors are often said to be hues from red through yellow, browns and tans included; cool colors are often said to be the hues from blue green through blue violet, most grays included. There is historical disagreement about the colors that anchor the polarity, but 19th century sources put the peak contrast between red orange and greenish blue. This concept is related to the color temperature of “visible light”, an important consideration in photography, television and desktop publishing. 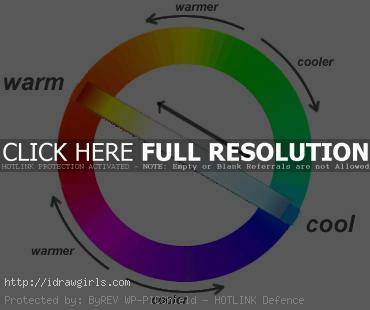 The determination of whether a color appears warm or cool is relative. Any color can be made to appear warm or cool by its context with other colors. Sample of warm and cool color harmony in illustration. Color theory has ascribed perceptual and psychological effects to this contrast. Warm colors are said to advance or appear more active in a painting, while cool colors tend to recede; used in interior design or fashion, warm colors are said to arouse or stimulate the viewer, while cool colors calm and relax. Most of these effects, to the extent they are real, can be attributed to the higher saturation and lighter value of warm pigments in contrast to cool pigments. Thus, brown is a dark, unsaturated warm color that few people think of as visually active or psychologically arousing. -Make custom color palette for digital painting.